KIDZ BOP And Live Nation Announce "KIDZ BOP World Tour 2019"
NEW YORK, Dec. 6, 2018 /PRNewswire/ -- KIDZ BOP, the #1 music brand for kids, and Live Nation announce the global expansion of the KIDZ BOP live tour phenomenon with the launch of an all-new show for next year -- KIDZ BOP World Tour 2019. The KIDZ BOP Kids will perform in Australia, Germany, London, Mexico, and more, in addition to playing to 50+ cities across the U.S. and Canada. Tickets will go on sale to the general public beginning Friday, December 14 at 10 am local time at LiveNation.com. Subway Fresh Fit for Kids® is an official partner of the KIDZ BOP World Tour 2019 in North America, and a leader in offering on-the-go families balanced, customizable meals, and better-for-you kids' meals. The announcement comes on the heels of KIDZ BOP's 2018 tour -- its most successful tour in franchise history -- where the KIDZ BOP Kids played to hundreds of thousands of kids and families across North America. The KIDZ BOP Kids, Billboard Magazine's "#1 Kids' Artist" for eight consecutive years, will kick off their World Tour in Australia during a special televised performance in January. The U.S. KIDZ BOP Kids will then join the British KIDZ BOP Kids to perform their first headlining show in the U.K at the Eventim Apollo, Hammersmith on April 20. The tour continues next summer when the KIDZ BOP Kids bring their all-new show to North America -- beginning in San Diego, California on May 31 -- making stops at Los Angeles' Hollywood Bowl, New York's Northwell Health at Jones Beach Theater, Denver's Red Rocks Amphitheatre, and more. The brand-new show is an interactive experience for the whole family. The KIDZ BOP Kids will be performing some of today's biggest hits "sung by kids for kids," with engaging new set design, exciting choreography, and more. Additional tour dates to be announced in early 2019. Victor Zaraya, President of KIDZ BOP, adds, "Over the past five years, we have established KIDZ BOP tours as an annual must-see live concert event for families, playing to sold out crowds in some of America's most iconic venues from coast to coast. This year, we are excited to expand internationally to create first concert experiences and life-long memories for kids worldwide." 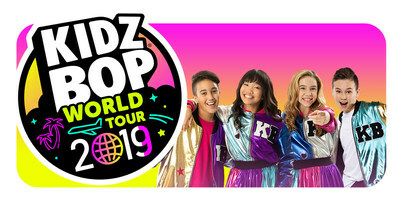 Citi is the official presale credit card for the KIDZ BOP World Tour 2019. As such, Citi cardmembers have access to purchase U.S. presale tickets, which are available beginning Tuesday, December 11 at 10:00 am local time until Thursday, December 13 at 10:00 pm local time through Citi's Private Pass® program. For complete presale details visit www.citiprivatepass.com. Subway offers a fresh alternative to traditional fast food, serving 7 million made-to-order sandwiches a day. Guests choose from over 4.9 billion combinations of quality proteins, fresh vegetables, and bread baked daily in the U.S. The world's largest restaurant chain serves nutritious options and delicious subs, soups, and salads at about 44,000 restaurants in more than 100 countries. The Subway experience is also delivered online at Subway.com.